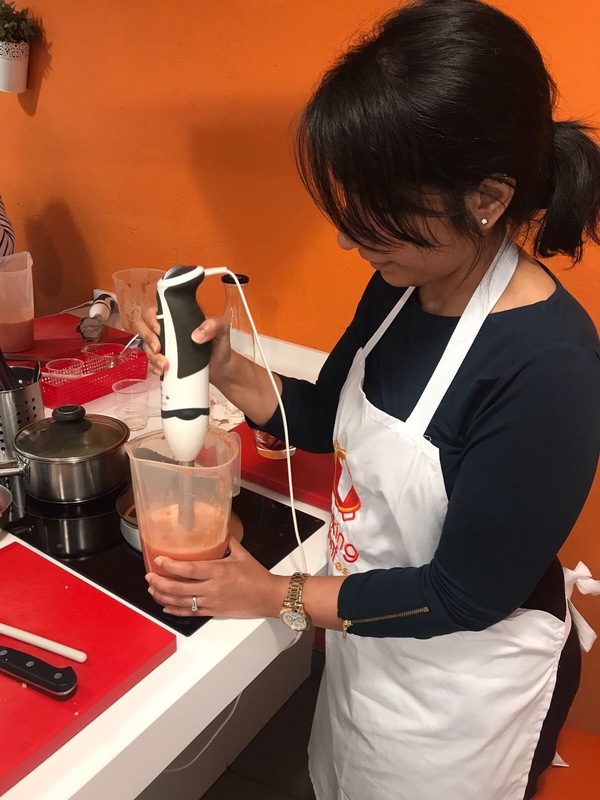 One of the things that interests me the most about visiting any new place is it’s food and over time, I have found myself gravitating away from fast food chains and leaning more and more towards local cafes, food tours and cooking classes. I love these experiences and come back home excited to try out recipes and relive my travels through them. 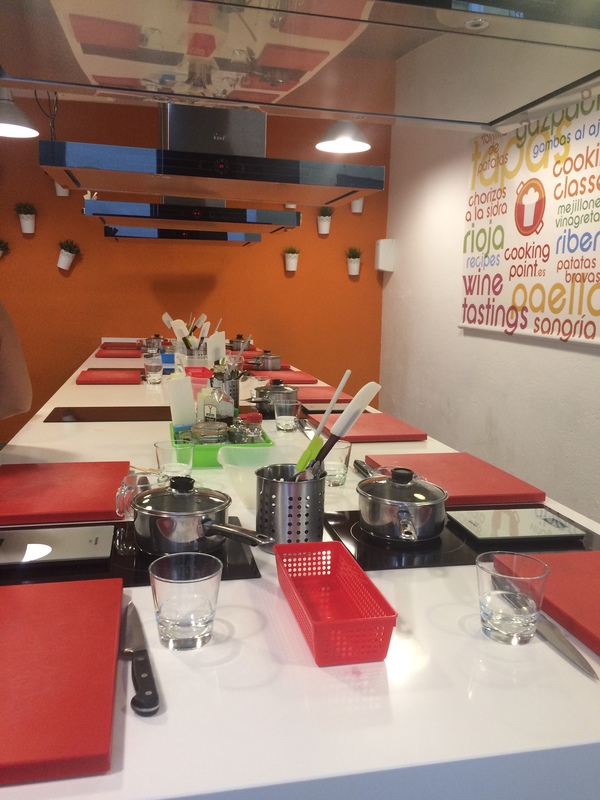 My heart was set on trying a local cooking class and I researched online for a good one that I could join end minute. 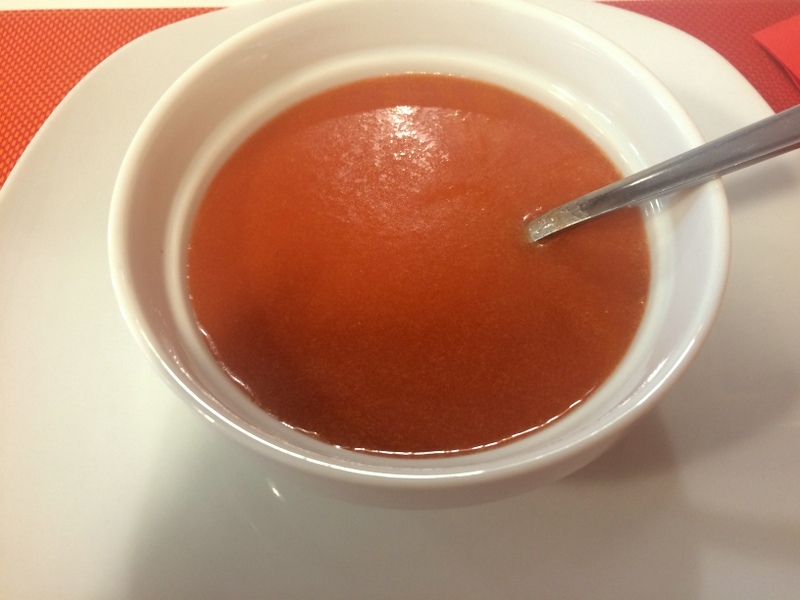 I wrote to quite a few, only to be turned down by all except one, which was Cooking Point in central Madrid and walking distance from where I was staying. Frankly, I wasn’t thrilled as this was not on the top of my list – while the reviews were spectacular (#1 on TripAdvisor), it looked more commercial and I was hoping to try something more intimate and local. But time was running out, and when they emailed me that they had 1 spot left, I decided to go for it. 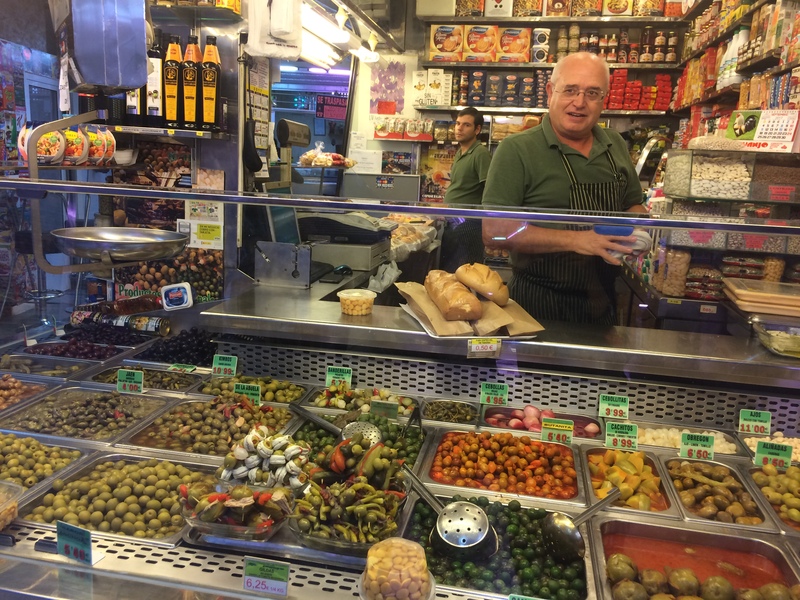 Located in Calle de Moratín, I reached the studio and met our guide and chef for the day, made the payment after which I was told to wait for the others. People began trickling in and everyone seemed friendly and eager to get started. 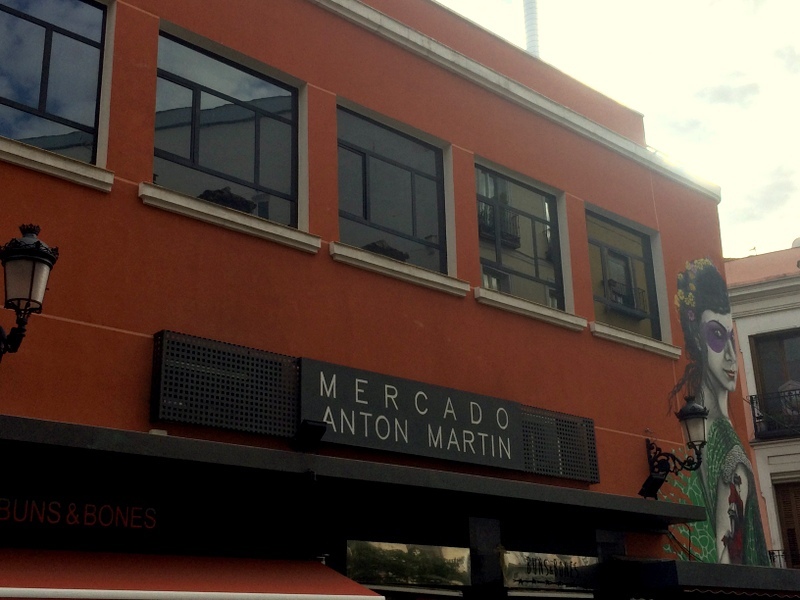 The first step was a visit to the legendry food market Anton Martin, to pick local produce of meat and vegetables. 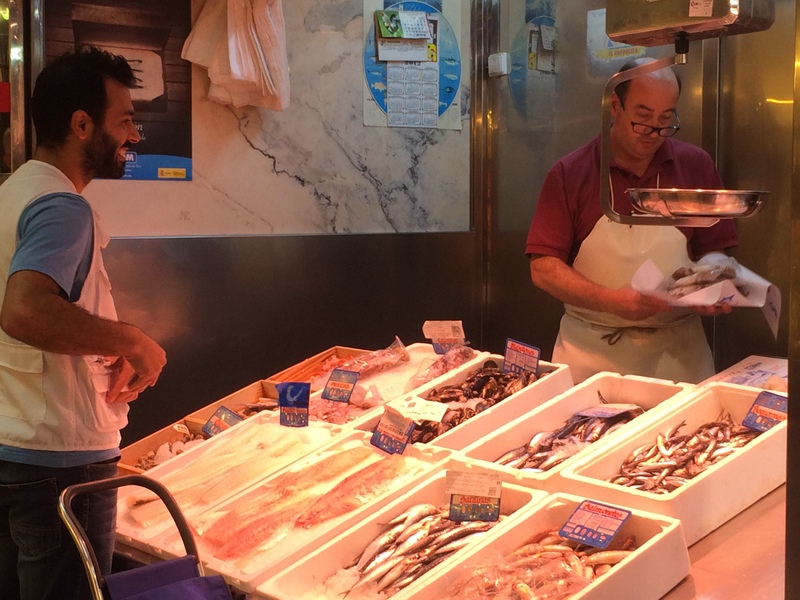 This was an amazing experience for me, as I anyway love picking groceries and Anton Martin had over 60 shops selling everything from meats, to seafood, to olives to all sorts of wonderful vegetables. We smelled great produce, understood how to pick vegetables and meats and after 45 minutes well spent, we walked back to the studio. Once back at the studio, we were divided into groups of 2. I was the only one trying the class solo, but I got a partner from a wonderful trio of ladies. Each group was given one gas stove, chopping boards, knives and all cooking utensils needed for the class. 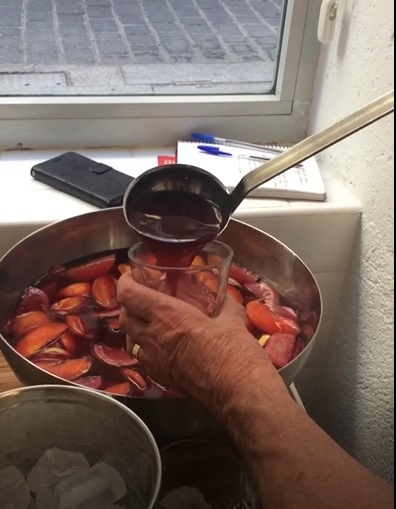 We first began prepping for the Sangria. We began by pouring a bottle of wine into a glass jug. You don’t really need an expensive wine. Pass through a fine mesh and return to blender. Add some salt, pepper and cumin. Once soft, add 200 gms of diced calamari and fry till it gets white. Add 500 ml boiling fish stock (add saffron to the stock while it is boiling). Cover the rice and don’t mix further. Lower heat and let it simmer for 5-6 minutes. Arrange mussels on the rice and lower heat further. Let it simmer for 5-6 min. Add prawns to the dish and let it cook for 5 min. After everything was made, we all displayed our food and laughed and ate together. It was a wonderful experience with some lovely people and great home style food. Post lunch, the group clicked some photos and shared further travel plans. We were handed over a recipe booklet by cooking point and we said our byes. The experience doesn’t come cheap at a cost of 70 euros per person and typically takes 4 hours. But I was pleasantly surprised that I enjoyed it as much as I did. 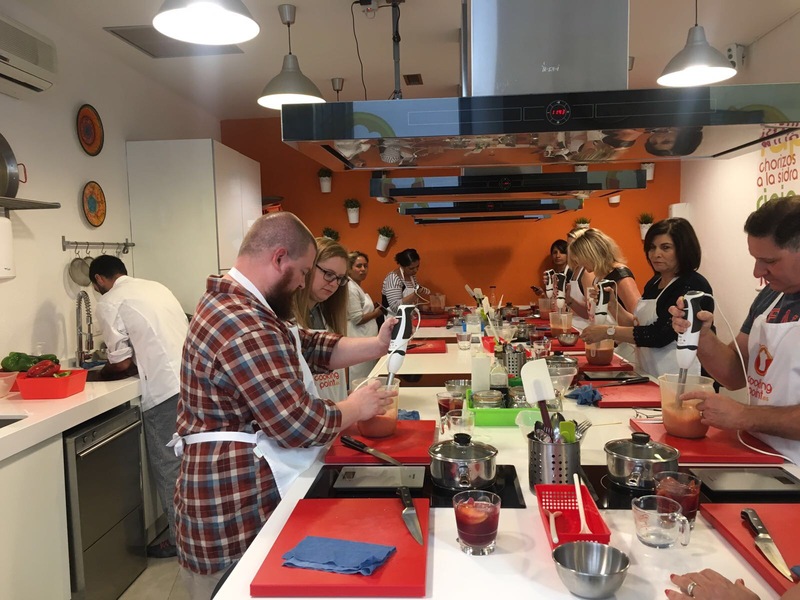 While it was more on the popular, commercial side of things, still there was something cozy and comforting about the way the class was conducted by Cooking Point, and the Sangria helps of course 😀 . If food floats your boat and you enjoy meeting new people, you will definitely walk away feeling satisfied. This experience was self-funded and not in collaboration with Cooking Point. All reviews are entirely my own. Thanks so much Camille! Did you try and make the Paella? Hope it turned out nice!